BHCT has led the fundraising for the KEMH Redevelopment Project for over three years through the “Why it Matters” capital campaign. Launched in 2011, the “Why it Matters” campaign has raised over $31 million to date. Now in its final phase, BHCT continues its fundraising efforts to reach its net $40 million dollar payment to BHB. 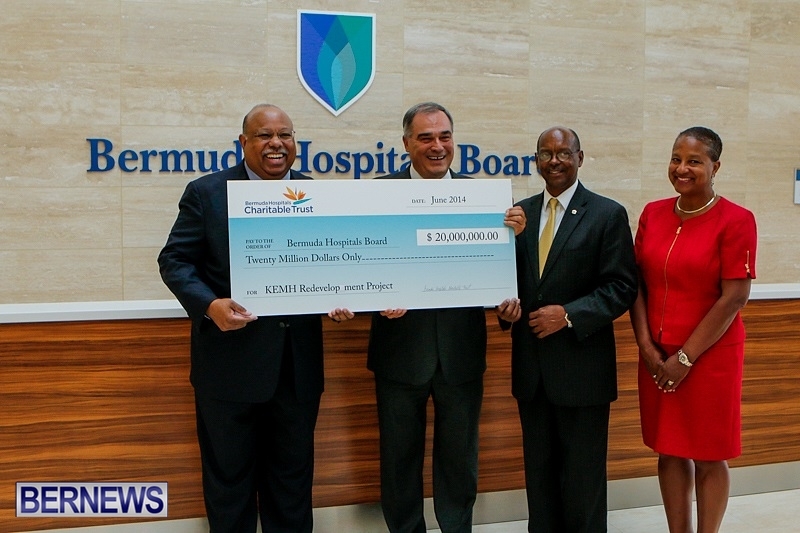 Today’s initial $20 million dollar payment represents the first of two installments to the Bermuda Hospitals Board, with the second taking place in the fall. Philip Butterfield, BHCT Chairman said “This history making campaign has brought together various constituency groups across our island for a common cause—that common cause being the redevelopment of our hospital. BHCT will engage local and international companies, community groups, families and individuals over the next few months to generate support and donations toward Bermuda’s hospital care. Ongoing fundraising initiatives such as the Legacy Walkway will continue through to 2015. Individuals wishing to make a donation to the cause can do so online at: www.bhct.bm. Well done Mr. Butterfield and committee – you all did an excellent job.